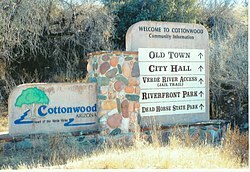 Cottonwood, population 11,500, is located in central Arizona, where the scenery is pretty, the values conservative, and the outdoor activities aplenty. Cottonwood is ringed with mountains and buttes, and it either contains or is minutes from golfing, canyons, thousand-year-old dwellings and wineries. A historic downtown, well-maintained, caps off the charm of this community. The median home value was $228,500 in late 2018, according to Zillow. Cottonwood has plenty of sunny days, great medical care and active senior programs, and is above average in walkability when compared to other communities. Cottonwood's January's high is about 60's degrees, and July's weather is hot, with plenty of sunshine and an average high of 100 degrees. 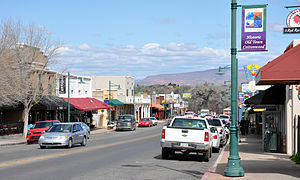 The Old Town Center for the Arts and the Cottonwood Public Library offers cultural opportunities in Cottonwood. The Cottonwood Parks and Recreation department is very active, providing exercise classes geared toward seniors. You can also sit in on community college classes. Verde Valley Medical is an award-winning acute care hospital. Prescott Municipal Airport is 58 miles away; the closest international airport is in Phoenix about 110 miles away.